In our charitable strategies series, read about the leading tactics for giving and granting, how other donors approach charitable giving, ways to optimize your giving for tax efficiency, and how you can increase the charitable benefit to nonprofits. In part one of our series, we will dive deep into how you can make the greatest impact on your charitable giving by using cost-saving tools. Giving tools, such as private foundations or donor-advised funds, can be helpful for managing your philanthropy, especially if there are large sums involved. Although there are expenses associated with these tools, these fees often cover overhead and other operational activities to make your giving more effective. For example, with a donor-advised fund (DAF), granting costs are covered by assessing a fee on the assets in the fund. Fees cover granting activities including conducting due diligence on all recommended grants against IRS guidelines and processing grants to charities. These fees are necessary to operate a DAF, but in excess, fees can create a drag on investment growth. Over time, excessive fees may reduce the potential to grow charitable assets, eroding both returns earned in the market and funds available for granting. The higher the fee, the greater the erosion. Low fees, however, leave more money invested, allowing charitable assets the opportunity to grow and more dollars to be granted. When evaluating giving tools, there is much to consider, but one question is key: How do I maximize the impact of my gift? Our DAF accounts feature a low all-in fee structure to encourage more charitable growth. The positive effect of low fees compounds over time—allowing you to give more to charity. Read more about our all-in fee here. In the following scenario, three DAF accounts, each with $250,000 invested, earn a 5% annual return. However, each account is assessed a different annual fee, resulting in varying growth rates and charitable balances over time. Effective giving requires effective cost management. Charitable tools like DAFs help you give tax-effectively and within your constraints—all in support of your charitable goals and nonprofit beneficiaries. 1 All investments are subject to risk. Diversification does not ensure growth or protect against a loss in a declining market. 2 The average all-in fee for Vanguard Charitable is based on a tiered administrative fee and average investment fee for Standard accounts. The 1.31% fee is based on a survey of the donor-advised fund landscape. 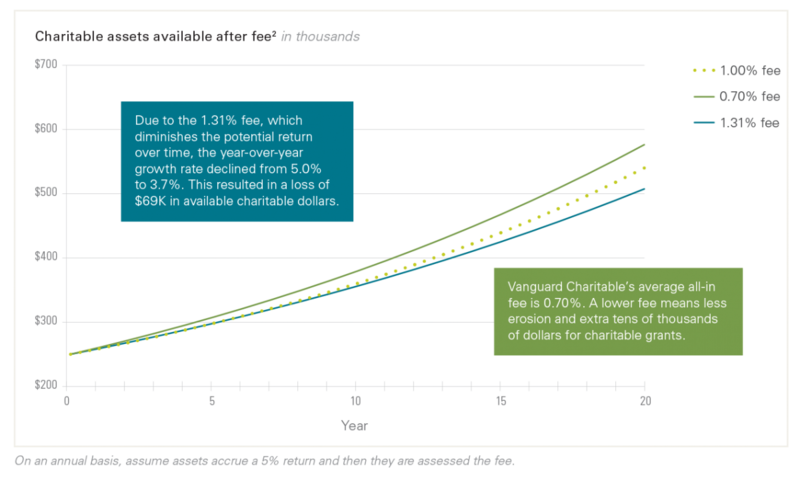 The 1.00% fee is an average of Vanguard Charitable and the industry average investment fees to serve as a mid-point example.